This blogpost covers methods used in the disruption of lncRNA function. Specifically focusing on RNA interference (with siPOOLs), antisense oligos, and CRISPR approaches. Challenges faced with these approaches are addressed. Long non-coding RNAs (lncRNAs) make up a major subgroup of RNAs and are defined as over 200 nucleotides long with limited protein-coding potential. There are three times as many genes producing lncRNAs as opposed to proteins. Numerous studies have described functional roles of lncRNAs in development and disease. This has stimulated major global interest and intense efforts to decode lncRNA function. One way to find out what a lncRNA does is to decrease its expression, thereby disrupting its function. 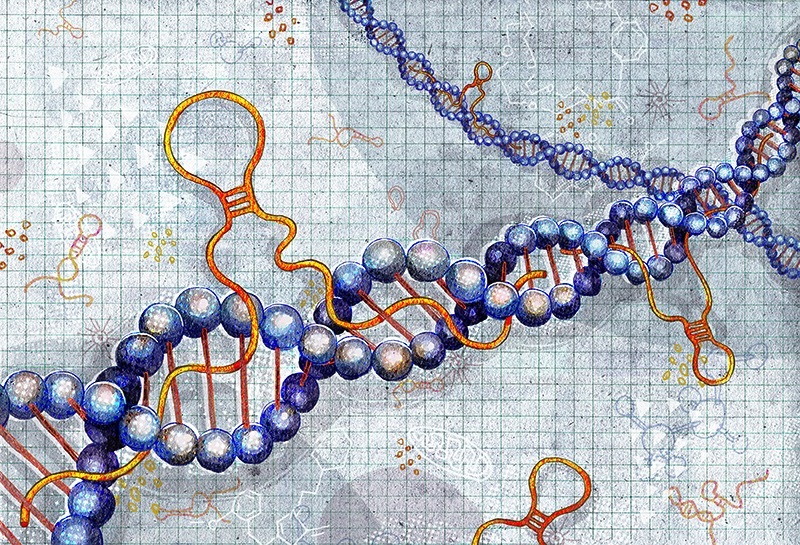 Current methods of downregulating lncRNA expression include knockdown approaches with siRNA and antisense oligos (ASOs), or knockout approaches with CRISPR, TALENs and other techniques involving DNA nucleases. As we have mentioned before, knockdown and knockout approaches employ different mechanisms and as a result sometimes yield different results. Hence it is highly recommended to employ both techniques when possible to thoroughly validate lncRNA function. LncRNA knockdown involves the transient downregulation of lncRNAs at the RNA level. This typically involves RNA degradation mediated by the RNA interference (RNAi) machinery for siRNAs, or with RNase H for ASOs. Figure from Watts, J. K. & Corey, D. R. Silencing disease genes in the laboratory and the clinic. J. Pathol. 226, 365–79 (2012). Does cellular localization matter when disrupting lncRNA function? Cellular localization of lncRNAs was reported to account for differences in knockdown efficiency by ASOs compared with siRNAs. Although there have been observations that RNAi factors are present in the nuclei, siRNAs were reportedley less efficient than ASOs for modulating nuclear-localized lncRNAs (Lennox and Behlke, Nucleic Acids Res, 2016). 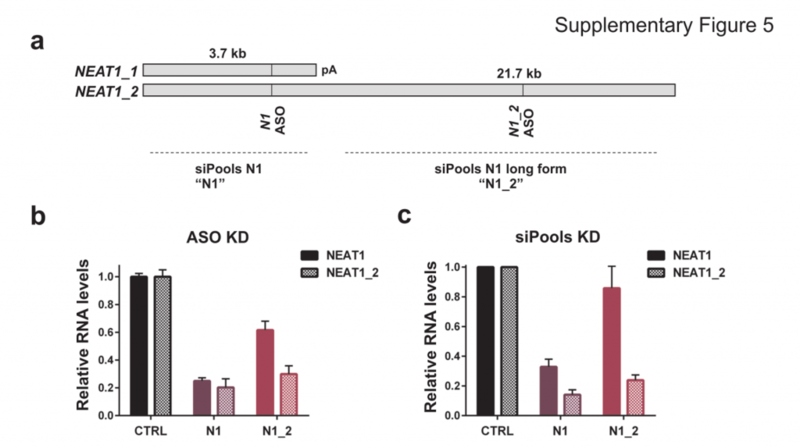 siPOOLs also worked well for XIST and MALAT1 (~80% KD at 1 nM), both nuclear-localized lncRNA. Notably however, cytosolic-localized lncRNAs such as H19 were much more efficiently targeted with the high complexity siRNA pools (> 95% KD at 1 nM). siTOOLs Biotech in-house data showing knockdown efficiencies of siPOOLs against 16 lncRNAs tested at 1 or 3 nM in standard cell lines (MCF7, A549, Huh7). Assayed by real-time quantitative PCR after 24h. Compared to coding genes, the above-mentioned factors do limit efficiencies of knockdown approaches. But with siPOOLs, the greater diversity of siRNA sequences is expected to increase chances of association with the target RNA. In-house data shows 12 of 16 tested lncRNAs showed good knockdown efficiencies of > 70% with siPOOLs. The genomic distribution of lncRNA loci is rather complex. They are typically categorized in relation to their proximity with protein coding genes. Sense – The lncRNA sequence overlaps with the sense strand of a protein coding gene. Antisense – The lncRNA sequence overlaps with the antisense strand of a protein coding gene. 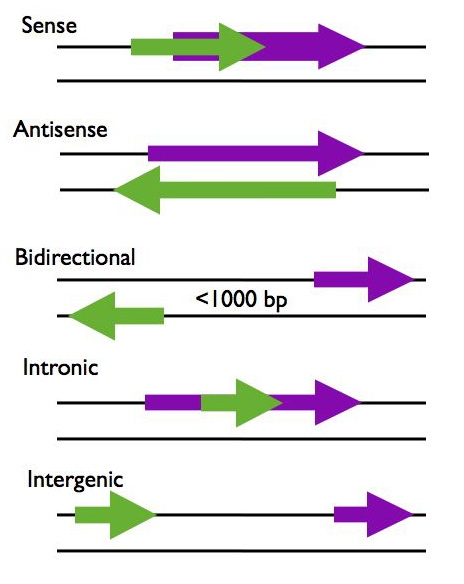 Bidirectional – The lncRNA sequence is located on the opposite strand from a protein coding gene whose transcription is initiated less than 1000 base pairs away. Intergenic – The lncRNA sequence is not located near any other protein coding loci. Hence disrupting lncRNAs with DNA nucleases can be a challenging affair that runs the risk of affecting neighbouring genes. How many lncRNAs can be CRISPRed? Goyal et al. 2017 performed a genome-wide “CRISPRability” analysis to evaluate the risks and utility of CRISPR for disrupting lncRNA function. Introducing mutations with CRISPR is generally not applicable for lncRNAs. Mainly due to difficulty predicting active functional domains and the fact that some lncRNAs exert phenotypes through the act of transcription per se. Deleting the entire lncRNA is an option but not when it overlaps with other genes. Hence, the major approach is to target lncRNA promoters. But then we run into the problem of affecting neighbouring genes that share promoters. Rule 1: Sense, antisense and intergenic lncRNAs are considered “non-CRISPRable” when transcribed from bidirectional promoters, defined by presence of another promoter present 2000bp upstream/downstream of lncRNA start. Rule 2: Sense, antisense and intergenic lncRNAs are considered “non-CRISPRable” when the start of the lncRNA is located closer than 2000p to the start of the neighbouring gene, excluding lncRNAs transcribed from bidirectional promoters – termed “proximal promoters“. Rule 3: Sense and antisense lncRNAs are considered “non-CRISPRable” when transcribed from internal promoters, where the start of the lncRNA falls within the gene body of another coding/non-coding transcript. This would include intronic lncRNAs. The study went on to corroborate the relevance of the classification by testing effects of CRISPR/Cas9 compared to ASOs/siRNA on their targets and neighbouring genes. An example involved lncRNA HOTAIR that arises from the HOXC locus which regulates expression of several genes including HOXC11. They found that dCas9-KRAB , which produces CRISPR-based transient inhibition (CRISPRi) by blocking transcription, caused knockdown of HOXC11 when designed to target HOTAIR. This occurred for all 3 independent sgRNAs. 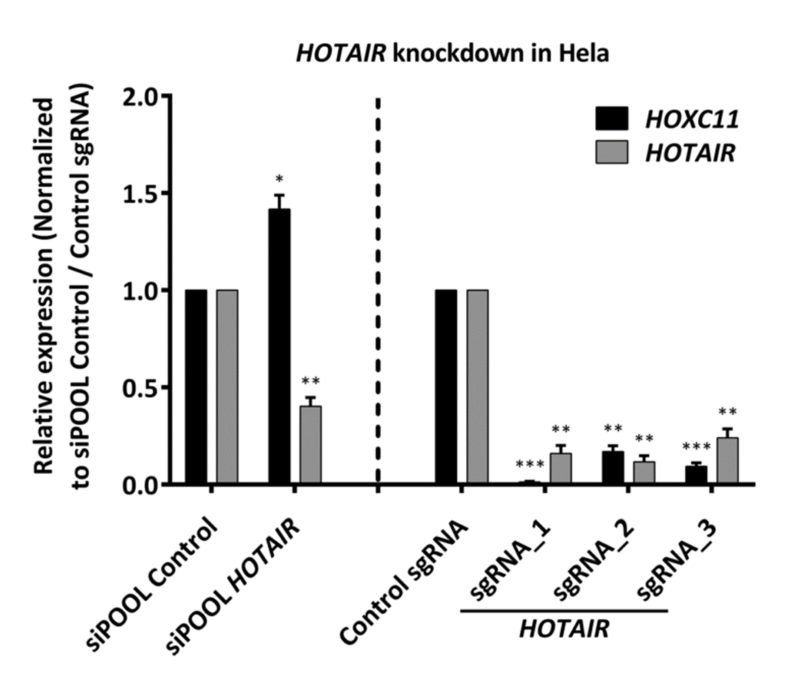 siPOOL-mediated knockdown of HOTAIR, in contrast, did not affect HOXC11. Similar scenarios were seen with coding genes, in particular for well-known tumour suppressor TP53, where neighbouring gene WRAP53alpha tended to be downregulated by dCas9-KRAB. This effect was absent with siPOOLs targeting TP53. It therefore pays to carefully note the genomic neighbourhood of lncRNAs when using CRISPR for disruption. A careful scientist would also monitor the expression of neighbouring/overlapping genes in parallel to the target gene. Orthogonal methods such as RNAi (with siPOOLs), or rescue experiments that restore expression of the lncRNA, is recommended to fully evaluate lncRNA function. RNA affinity purification (RAP) experiments enable the isolation and analysis of interacting molecules with an RNA of interest. Often performed to gain insight into RNA function, it is gaining popularity in the study of lncRNAs but can also be applied to coding RNAs. The general workflow involves preserving nucleic acid and protein interactions with a cross-linking reagent, followed by lysis and sonication to shear nucleic acids to sizes amenable for pulldown. Biotin-labelled DNA probes (which we offer, see raPOOLs) are added to the lysates and hybridize with the RNA of interest. This enables the isolation of the RNA and its associated molecules through the high affinity biotin-streptavidin interaction between biotinylated probes within the complex and streptavidin-coated magnetic beads. The complexes are then disrupted and individual components analysed by various methods: western blotting/mass spectrometry (for proteins), sequencing/northern and southern blots/PCR detection (for nucleic acids). A detailed protocol can be found here. If trying to detect protein partners of the target RNA, sufficient amounts of target RNA have to be isolated as unlike nucleic acids, proteins cannot be amplified. It is always advisable to determine the number of copies of the target RNA per cell to examine how much input material is required. As a guide, XIST is expressed at < 2000 copies/cell and required 50-250 million cells (depending on cell type) per pulldown condition to visualize proteins by immunoblotting/MS (Chu et al., 2015). For some lowly expressed lncRNAs, up to 1 billion cells may be required per pulldown! If your RNA is too lowly expressed and RAP is not feasible, other methods involving FISH and immunofluorescence imaging or protein arrays might be explored. Cross-linking reagents produce covalent bonds between nucleic acids and proteins in close proximity with each other, stabilizing these interactions for subsequent analysis. Formaldehyde (CH2O) and glutaraldehyde (C5H8O2) are most commonly used and cross-link direct and indirect associations between proteins-proteins, nucleic acids- nucleic acids and nucleic acids-proteins. Compared to formaldehyde, glutaraldehyde has two reactive groups, making it a stronger cross-linker. It also fixes long range interactions compared to formaldehyde, a zero-length cross-linker. Formaldehyde fixation can be reversed by heating at 65◦C for 6 h, while glutaraldehyde fixation is irreversible. Alternatively, UV irradiation produces irreversible cross-links only between nucleic acids and proteins. There are a whole range of other cross-linking chemicals one could use in combination that can cross-link different reactive groups and at different ranges, but take note that the activity of cross-linking chemicals is highly determined by pH and buffer conditions, so be sure to follow given protocols closely and ensure reagents used are fresh. Note also that the longer cross-linking is carried out, the harder it is to sonicate nucleic acids down to smaller fragments. Sonication is an effective way to randomly shear nucleic acids to increase efficiency of their pulldown, hence improving detection sensitivity. Ideally, fragments should be sheared down to ~100-500 bases. If using PCR detection, be aware that your amplicon size should be small enough to lie within these sheared fragments. Factors affecting sonication efficiency include volume of sample, sonication strength, frequency and duration and if using probe sonicators, probe position/depth. Follow the instrument manufacturer’s instructions closely and optimize duration of sonication by collecting samples at time-points and studying the extent of fragmentation. If using probe sonicators, ensure the probe is inserted into the lysate deep enough as frothing tends to occur during the sonication process. Always make sure to wipe the probe clean carefully each time. Due to the length of the protocol, take the usual precautions to avoid RNA degradation i.e. use RNase inhibitors, filter tips, and ensure temperatures are kept < 10°C. Lysates should be non-sticky and clear after sonication, which may take several hours. Pauses between sonications should be incorporated to avoid overheating of the sample. If you are more focused on isolating chromatin, take note that lysis buffer conditions may vary to ensure efficient lysis of nuclei. In this case, swelling buffers may be incorporated and additional lysis steps might be required. Refer Chu et al., 2011.
which is usually more than sufficient. However one can perform the hybridization with a range of probe concentrations to determine the optimal condition. Hybridization temperatures can also be varied with higher temperatures known to increase stringency of probe association. As mentioned before, detection sensitivity is lowest for proteins, hence aliquot the beads in a proportion where most are used for protein analsis with a small proportion for nucleic acid detection. Benzonase is used to remove nucleic acids leaving proteins intact which can then be precipitated with TCA in the presence of deoxycholate. An acetone wash usually follows to remove the deoxycholate. Alternatively, biotin elution can be performed to compete out streptavidin binding sites and release complexes. It is recommended to separate the isolated proteins by PAGE to simplify the sample for MS analysis. 6. How much pulldown is enough? The efficiency of RNA enrichment is determined by the difference in amounts of target RNA in the pulldown fraction as compared to the input fraction (i.e. lysate post-sonication and prior to probe hybridization). Be sure to account for the fraction of input used in the analysis. For a calculation guide, download this sheet. Fold enrichment is obtained by comparing against a negative/background condition. This may be performed using a negative control raPOOL which targets sequences not found in the cell. Non-target genes such as GAPDH/Cyclophilin A can also be analysed in the pulldown and input conditions to indicate pulldown is specific for the target RNA. As a guide to how much pulldown is enough, Chu et al. retrieved ~60% of their target RNA and were able to analyse isolated proteins by western blotting and MS. One could also measure target RNA in lysates that have been subjected to pulldown, and a corresponding depletion of the target RNA should be observed.